I don't remember how it started; I really don't. 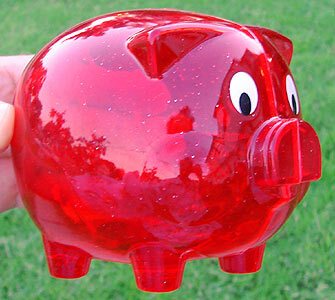 But several years ago, I began a 4th of July tradition of putting "ground bloom" fireworks within a transparent plastic piggy bank that is literally a pig. This is an aesthetic and quite tidy plan, you see, for the multi-colored firework chases around the inside of said pig, and puts on a show without spreading little bits of paper shrapnel everywhere. That's the case when you have a big enough pig, which I didn't find this year. 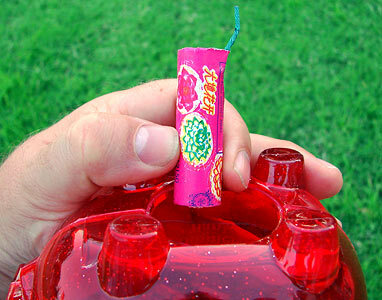 I used to get clear plastic pigs at Wal-Mart in the ever-shrinking non-licenced property toy section near the bags of plastic soldiers who would also meet their pyrotechnic doom at my hands. 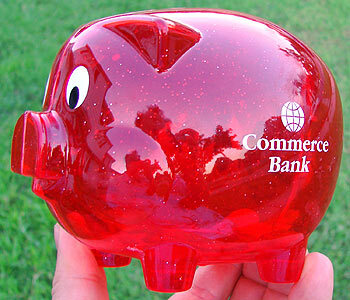 This year, I was not able to find the larger transparent pigs anywhere, so I settled on buying ($3) these these much smaller tinted plastic pigs that I'd seen at Commerce Bank, where I have one of my accounts. I should stress that I have nothing against Commerce and I quite like my tellers; they were just the only vendor of plastic pig banks in town. 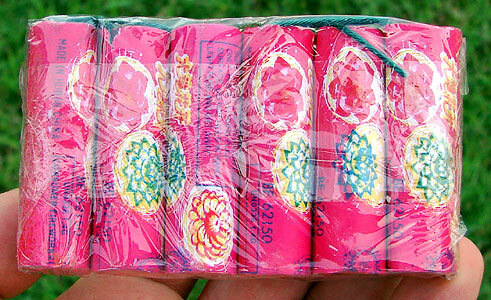 So, now that we have the plastic pig (made in China), we need ground blooms (also made in China). These were $1.25 a pack at my local firework tent. Yeah, American dollars for two Chinese goods. I'm part of the problem. 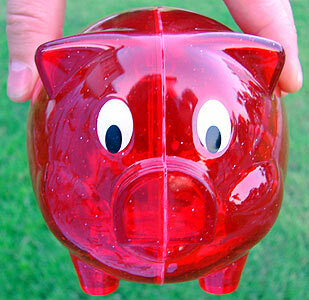 The ground blooms fit easily into the coin retrieval hole on the underside of the piggy. Look at him - so trusting. Does he know what's coming? Well, the first attempt didn't turn out so well because the smoke came right at the camera and there was no usable video. It was also obvious that the down-sized pig did not allow enough room for the firework to twirl within, and the red tint didn't let the other colors of fire show through. This sort of project, by the way, is the perfect use for that scratched UV or skylight filter you haven't thrown away yet. I used one and was very glad as it got a scorch mark. Attempt #2 failed because the auto-focus was confused by the smoke and bright light, so I switched to manual focus. Here is attempt #3. Yeah, we got a little fire but not the multi-colored swirl we'd have with a bigger non-tinted container. Attempt #4. Pardon my bad grammar at the end; I was trying to be folksy. Before I shut off the camera, you can hear the Southern-girl laughter of Patsy Terrell. I really need to stick to jackalope photos. Ace wasn't involved in this, and you can see what happened.